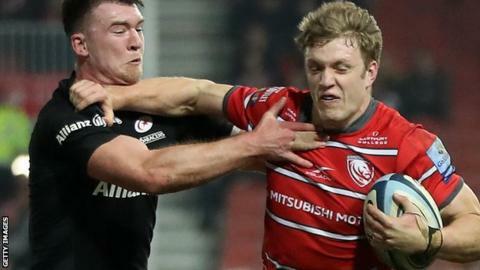 Gloucester beat the Premiership leaders for the second week in succession as Saracens slipped to defeat at Kingsholm. Seven days after seeing off Exeter, the Cherry and Whites inflicted a third loss of the season on the defending champions. Ben Morgan scored tries in each half and Ed Slater also crossed from close range to cap an impressive display. But Jackson Wray's last-gasp try earned Sarries an unlikely losing bonus point. Michael Rhodes and Matt Gallagher also crossed for the visitors, who are a point clear of Exeter. The Chiefs will hope to return to the top of the Premiership table on Saturday when they host bottom club Newcastle Falcons. Gloucester, who have climbed to third, spurned early chances for points but opened up a 16-3 half-time lead with Morgan's converted score and three Billy Twelvetrees penalties. Both of Morgan's tries were the result of strong work by the home side's forwards, with the England international number eight diving over from close range on both occasions. However, despite trailing by 20 points with six minutes remaining, Saracens fought back with two late converted tries to emerge with something to show for their efforts. Gloucester: Woodward; Marshall, Twelvetrees, Atkinson, Thorley; Cipriani, Heinz (capt); Hohneck, Marais, Balmain, Slater, Mostert, Ackermann, Kriel, Morgan. Replacements: Hanson, McAllister, Knight, Clarke, Polledri, Braley, Williams, Banahan. Saracens: Gallagher; Strettle, Lozowski, Barritt (capt), Lewington; Goode, Wigglesworth; Barrington, Tolofua, Koch, Day, Isiekwe, Rhodes, Burger, Wray. Replacements: Woolstencroft, Lamositele, Judge, Skelton, Clark, Spencer, Malins, Tompkins.